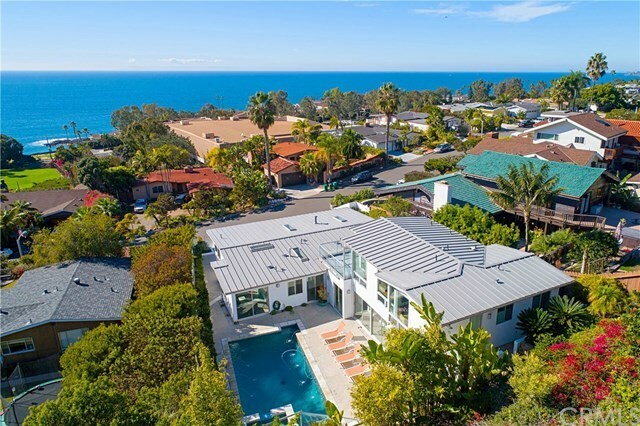 Abundant ocean panoramas and hillside/bluff views in this 6 bedroom South Laguna oasis. Spectacular pastel sunsets are yours every evening in this one-of-a-kind home newly built in 2008, with many recent upgrades including oak hardwood flooring throughout and brand new A/C. Prime real estate on quiet street overlooking the ocean from entire front of home which features full upper and lower level patios. Short distance to Montage Resort and beach; and to Lagunaâs eclectic cafes, bistros and art boutiques, as well as world-class shopping and fine dining along the coast. Attractive but unassuming front offers full privacy and security from the street. Front gates lead to very large home with brightly lit ocean-facing first level kitchen, dining and living area with double-sided fireplace, large kitchen island, granite countertops and sliding doors to first level patio. First floor is complete with four bedrooms, with ideal option for office overlooking pool area. Sliding doors from bedroom area hallway lead to phone app controlled spa and pool with large patio, outdoor fireplace, seating and grilling area. Staircase to 600-square-foot upper level opens to a second large entertaining space with two bedrooms and bathroom. Perfect for guests or a bright art studio/home office. With the right offer home is available fully furnished including high end luxury touches throughout! Beautiful!